Made from a blend of 65% Cabernet Sauvignon, 31% Merlot and 4% Petit Verdot, this spectacular 2003 hits all the sweet spots on the palate. A glorious bouquet of cedarwood, jammy black currants, cherries, licorice and truffle is followed by a dense, opulently textured, full-bodied wine with terrific purity and freshness as well as deep, velvety textured tannins. Enjoy this beauty over the next 10-12 years. Drink: 2014 - 2026. Tasted at Bordeaux Index's "10-Year On" tasting in London. The Pichon Lalande 2003 is a notorious wine that has so often displays off-putting vegetal notes. This is a much better bottle. It has a smudged bouquet of red berries, cassis, blackcurrant pastilles and a touch of violet. The merlot is very dominant here, rendering it almost like a Saint Emilion wine. The palate is medium-bodied with a fleshy texture, well-judged acidity and natural composure. 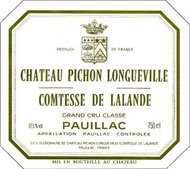 It is a forward Pichon Lalande, but it is very refined and harmonious with a sensual caressing finish. Tasted March 2013.